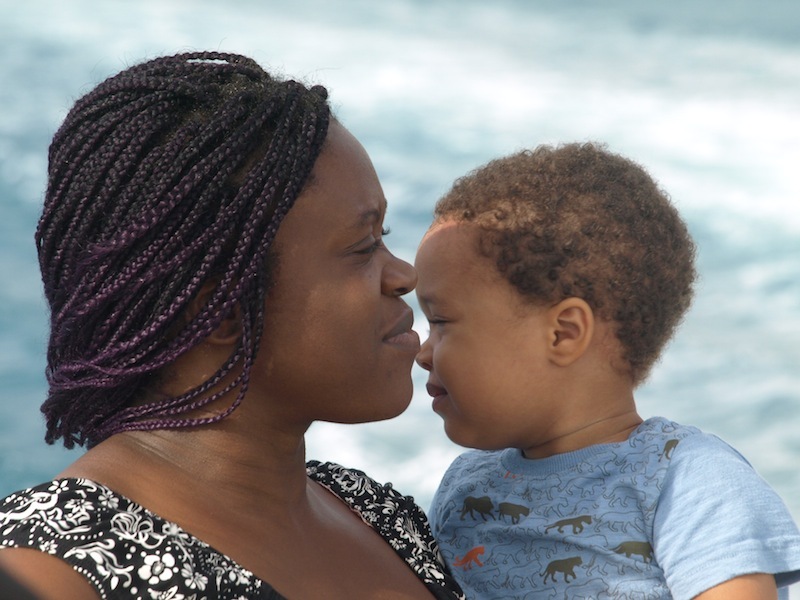 PART 2 of FRED and BEV’S TORRES STRAIT ENCOUNTER. 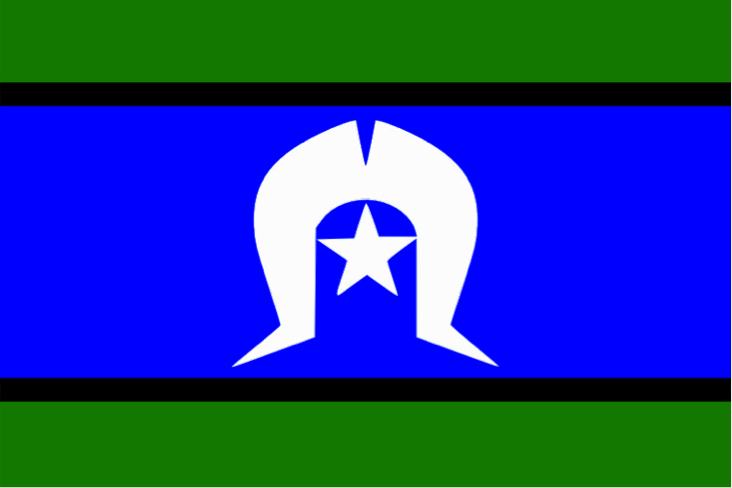 The Torres Strait Islander flag is a symbol for the unity and identity of all Torres Strait Islanders. Green represents the land, blue the sea, white peace and black indigenous peoples. The dhari (headdress) represents Torres Strait Island people and the five-pointed star the five major Island groups. The star also represents navigation, a symbol of the seafaring culture of the Torres Strait people. 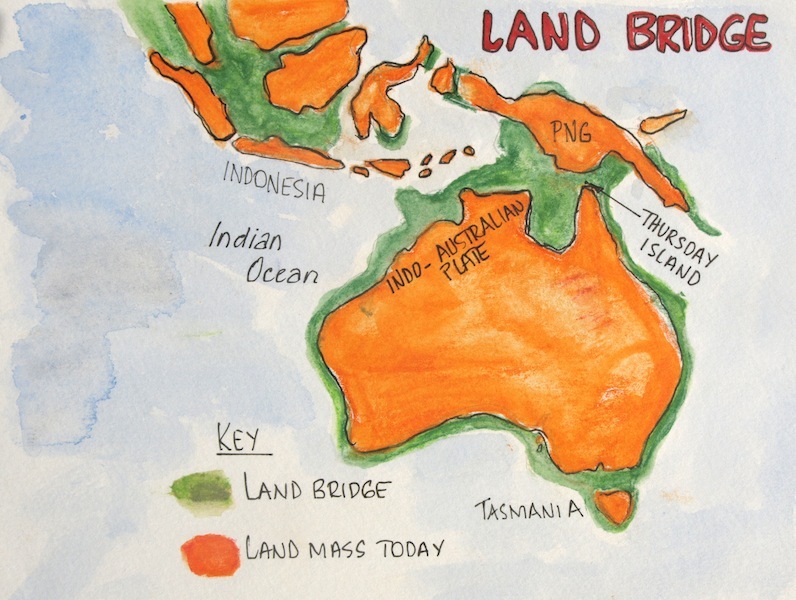 Modern evidence, including DNA analysis, confirms that Homo sapiens came out of Africa around 160 000 years ago and some of these wanderers moved across Asia and down the Indo-Malaysian archipelago, crossing over to Australia via PNG around 65 000 years ago. Sea levels at that time were 130 metres lower than they are today, allowing people to simply ‘island hop’, walking or wading from one region to another. 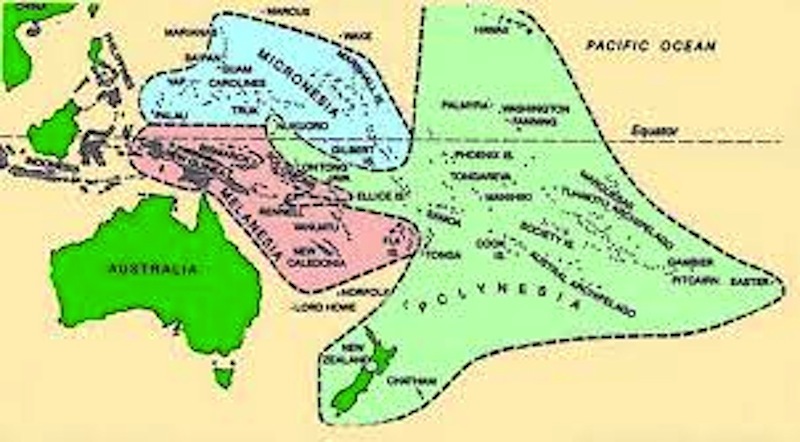 The peoples (Melanesians) who took up residence in the Torres Strait region did not, pre European contact, consider themselves a single homogeneous or unified group and this is why there are numerous languages and beliefs throughout the islands. After flying over or boating through the straits as we have been doing over the past few months it’s easy to imagine what the land bridge would have looked like. I see it as an extension of the Great Dividing Range, which runs from Victoria to Cape York. The islands we see today were the mountaintops of the Great Divide. An inactive volcano mountaintop of the Great Divide, one of the many in the Mer Group of Islands in the far NE of Torres Strait. For the map above I thank Jane’s Melanesian Home Page www.janeresture,com Prior to finding the above map I was never really sure where the boundaries of Melanesia, Polynesia and Micronesia were. In colloquial terms I can say I have a ‘handle on it’ now. 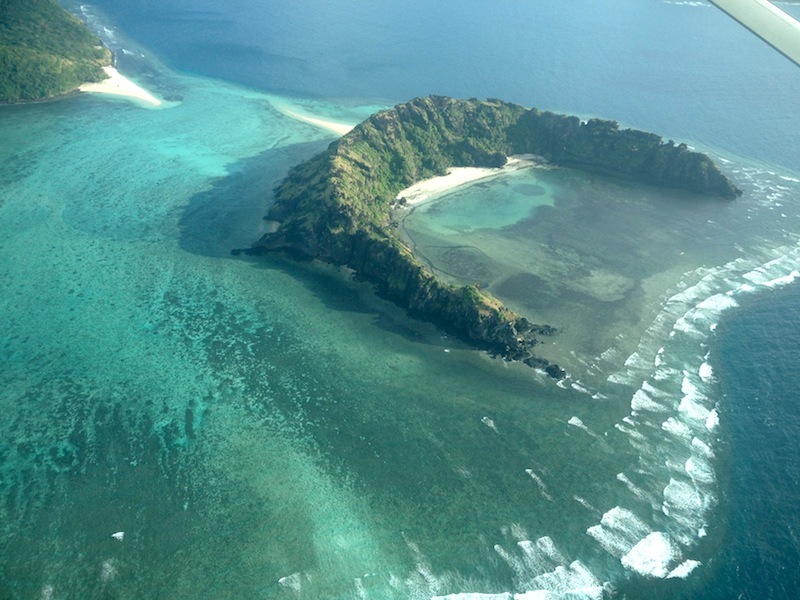 Radio 4MW, Thursday Island expounds ‘Transmitting over the Islands once ruled by warriors’. Dictionary references state a warrior to be a person of vigour and courage and capable of defending themselves, their friends, family, ideals and culture. From my readings of Torres Strait history and conversations with islander people of the region there is no doubt they were, and still are, fierce warriors when it comes to defending their rights. A recent example relating to defending their culture and ideals was when Eddie ‘Koiki’ Mabo and fellow plaintifs from Mer (Murray Island) claimed they were the traditional owners of the land on Mer. The High Court of Australia upheld the claim so warrior Eddie won the battle establishing legal ownership of traditional lands, not only for the inhabitants of Mer but of all Torres Strait and mainland Aboriginal people. Eddie Mabo as depicted on an Australian stamp 2013. 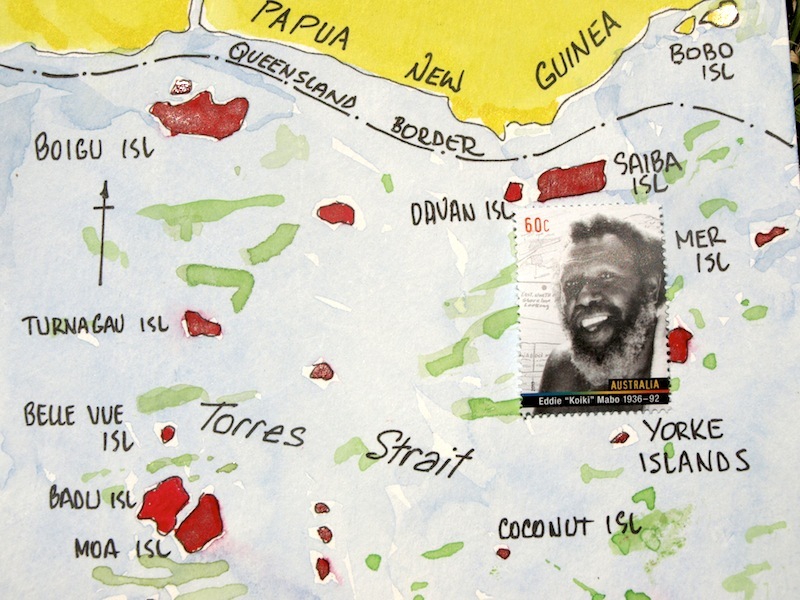 Eddie Mabo’s homeland, Mer Island, is shown on the right hand edge of the map. Eddie Mabo’s Mer Island is not new to me as in my late teens I read Ion Idriess’ book “Drums of Mer” and I was so impressed with the tales of adventure that I wanted to become a patrol officer in PNG. After completing the appropriate forms relating to the position my father refused to sign and give parental consent, so I never became a patrol officer. I wanted to join the navy too but again he refused. It makes me think whether parents always know what’s best? Early explorers, seafarers, adventurers and those intent on exploiting the natural wealth of the Torres Strait region experienced the protective doggedness of the Torres Strait warriors and after having many deadly encounters, referred to the area as the ‘Straits of Terror’. Many authors have picked up on the phrase including Australian writer Ion Idriess (1889-1979). Idriess related in his book ‘The Wild White Man of Badu’stories of witch doctors, war canoes, tribal fights and the collecting of severed heads as trophies. 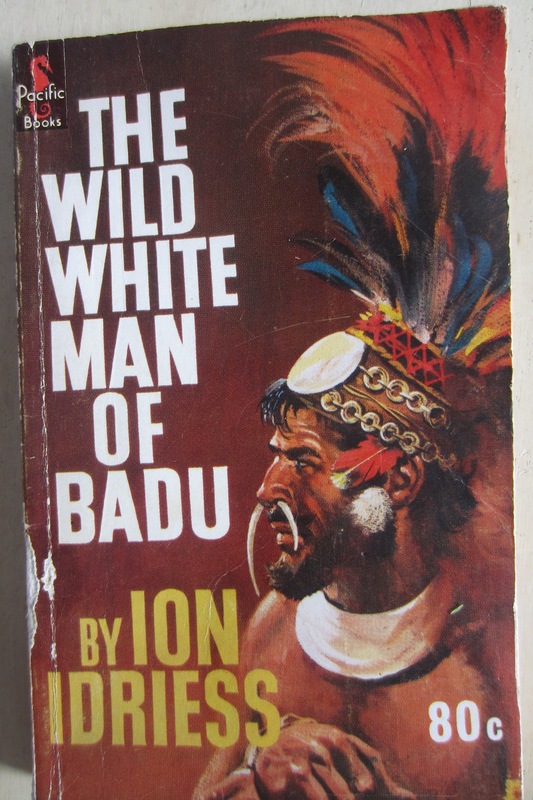 The Wild White Man of Badu narrative is a supposedly true story about the ambition of a ruthless escaped convict who, through stealth and cunning, established his own empire among the islands of the Torres Strait. It’s an interesting read as it gives an insight into how life may have been in the Straits of Terror prior to the ‘Coming of the Light’ in 1871. Front cover of Idriess book. Documentary filmmaker Ben Cropp penned a story, which appeared in the ‘Bow to Stern’ magazine February 2013 about the Straits of Terror. The story gives a graphic description as to the fate of castaways from the ship Charles Eaton at the hands of the local warriors. At first the warriors were friendly but next morning they went to the beach and decapitated all the adult castaways. Their heads were taken away to later adorn a huge ceremonial mask. The four children in the party were spared, two were traded with the chief of Mer (Murray Island) for a bunch of bananas and the other two were destined to live with the head-hunters until rescued by the crew of the ship Isabella two years later. There is no doubt that the inhabitants of the Straits of Terror adopted some extreme tactics and ritualistic methods to scare visitors off and who could blame them as after all they were only defending their patch as true warriors of the time would. The reign of terror inflicted upon intruders was justified in the minds of the warriors as some European explorers took liberties, for example Spanish explorer Torres in 1606 kidnapped three indigenous women for the use and pleasure of his crew. 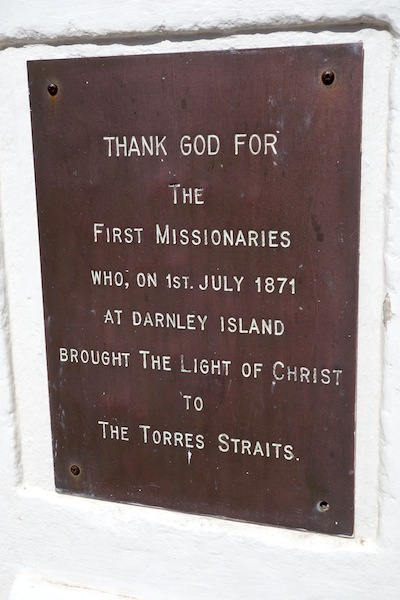 The aggressiveness of the Torres Strait warriors was tamed in 1871 when the non-denominational Reverend Samuel McFarlane of the London Missionary Society arrived. If a recent re-enactment of his arrival has any element of originality, his bible was his only protection. On July 1 every year the Coming of the Light event is re-enacted on most of the islands in Torres Strait. Re-enactment of the ‘Coming of the Light’ on Thursday Island this year. A canoe with the English colours flying beached and when an aggressive warrior threatened to spear the bearer of the word a Bible was held up as a defence shield. everywhere on the strait islands. 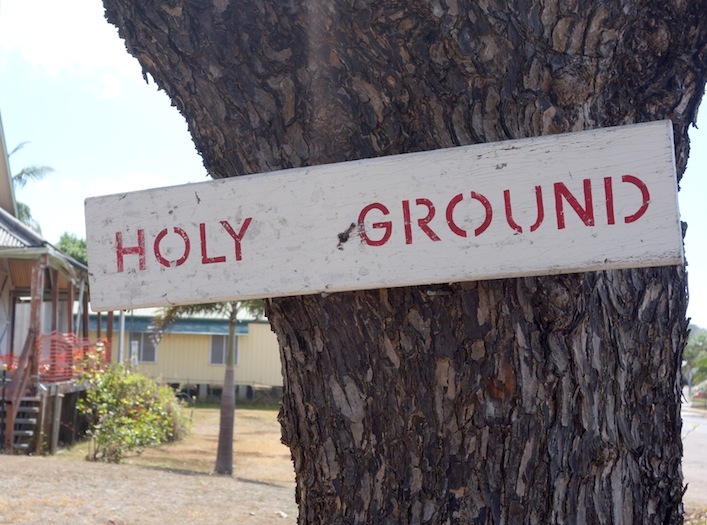 At the moment in the Torres Strait region there are at least seven religious groups expounding the word. The Anglicans have the biggest foothold followed by those of the Catholic and Pentecostal faith. Recently a couple of Thursday Island Jehovah’s Witness called and attempted to gather me into the fold. At the outset I told them I consider myself a humanist and they had no hope in getting me onto their books. I heard later that our encounter came up for discussion at a Bible meeting and the evangelists who called said I wasn’t such a bad bloke for a non-believer! 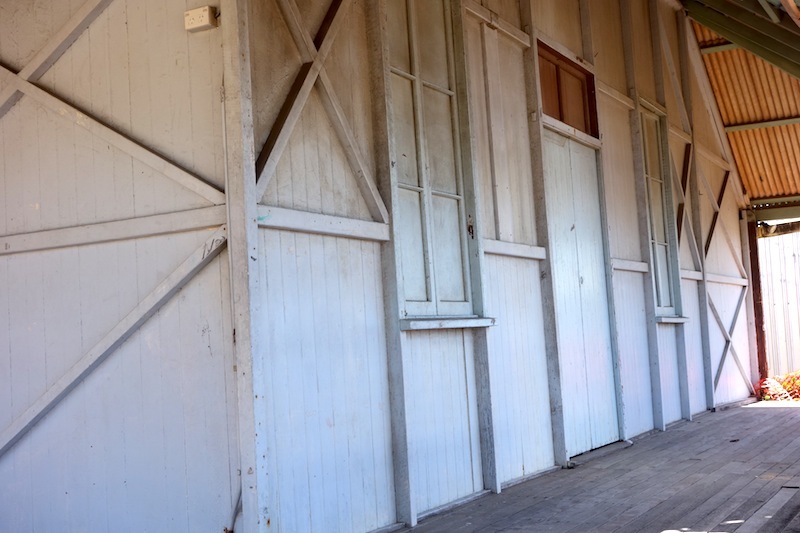 The old parish hall employing open stud construction. Some might think this open construction (no outer cladding) was a case of being thrifty, but not so. The reason this method was employed was to avoid having termites set up home in the cavity between the inner lining and the outer cladding. This method of building was used extensively in termite prone areas of Australia. 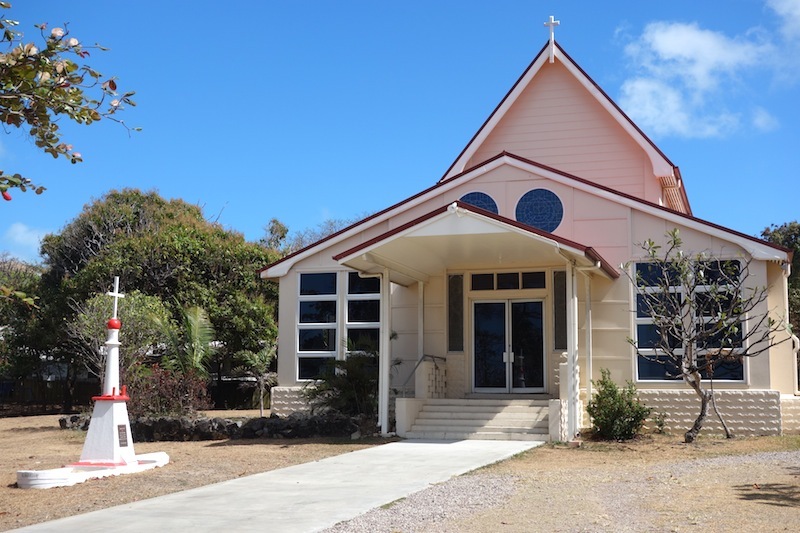 The Anglican Quetta Memorial Church on TI. The Quetta Church (the world’s smallest cathedral) was built in 1896 as a memorial to those lost in the wreck of the RMS Quetta in 1890. The date in February is still celebrated in a special service during which the church bell is rung 133 times, once for each of the lost souls. 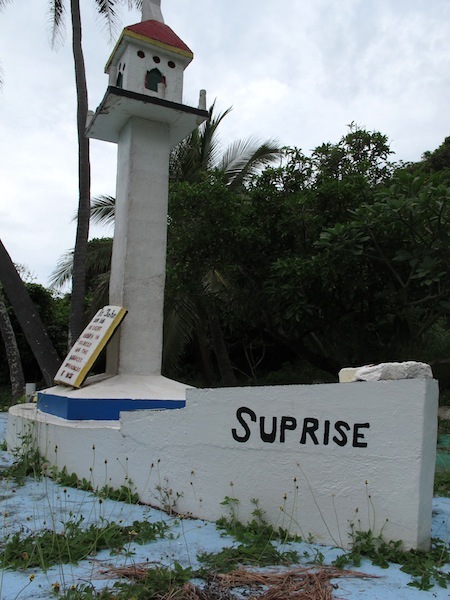 The red and white monument on the left is in the form of a boat and the cross at the masthead was the ‘Light’. Coming of the Light monument on Darnley Island. Our Lady of the Sacred Heart Church T.I. 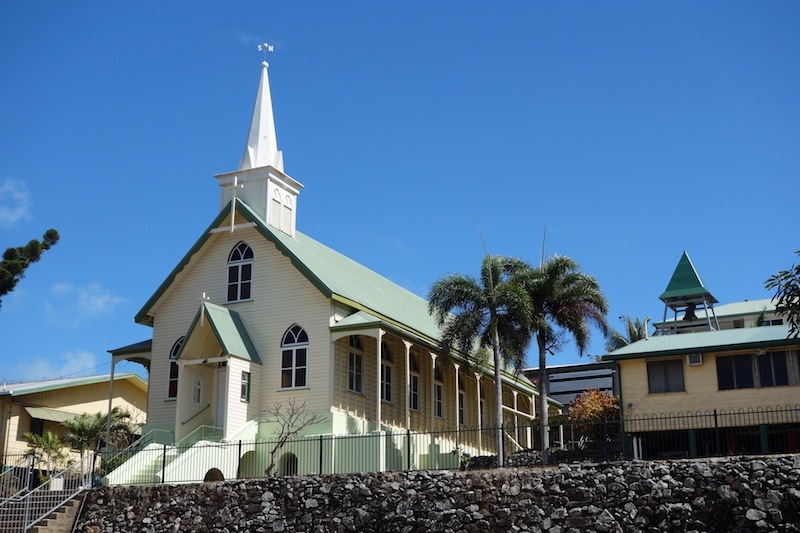 Not all churches are built on a hill but if it is possible to get your church up there on one it has the advantage of being seen and this is the case here as it dominates the main shopping area of T.I..
Beachfront St Paul’s Church, Moa Island. 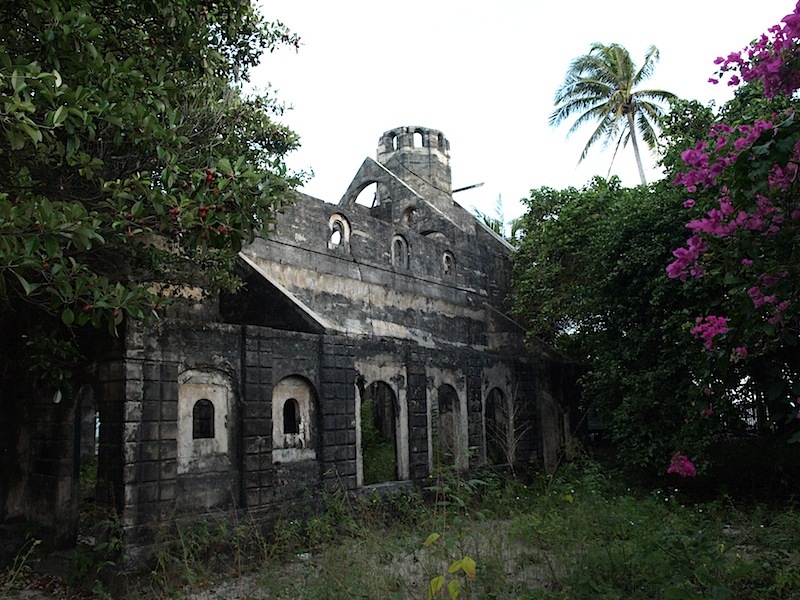 The Poruma (Coconut Island) Church of St Andrews. The foundation stone was laid in 1926 and the building reached bell tower stage before construction ceased. Cracks appeared before the church was finished. There was no guiding hand when it came to the construction of the Church of St Andrews. 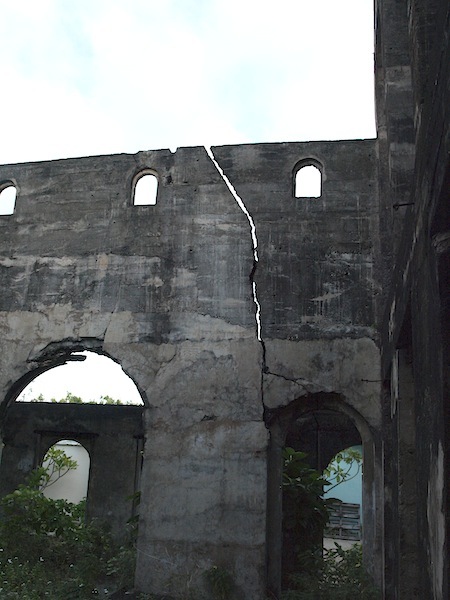 The church was never completed because cracks started to appear in the walls when the bell tower was being added. The walls were far too thin, had no steel reinforcing and shell grit was used as aggregate; not sound building practice. 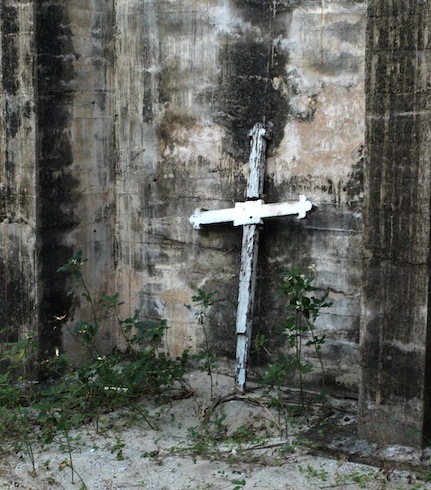 A cross standing guard in the ruins of St Andrews. 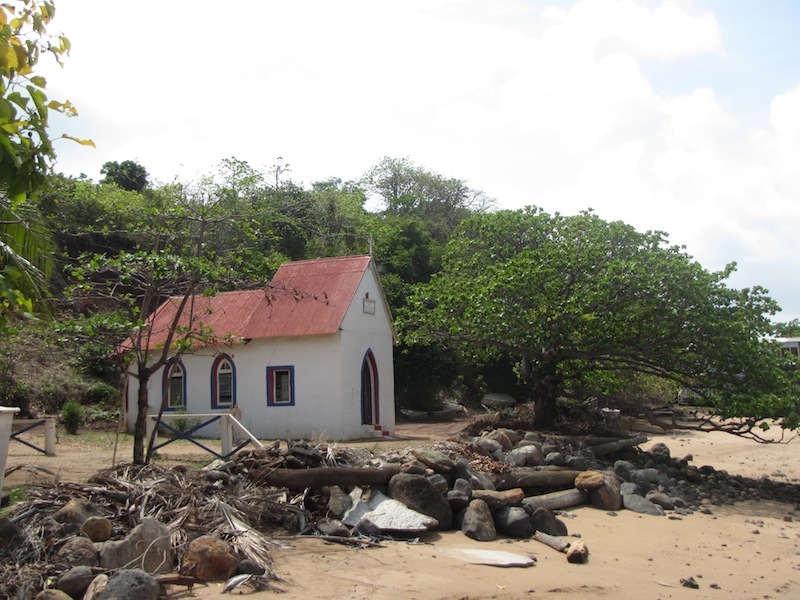 Many of the people of Torres Strait have an open and public commitment to Jesus. I overheard a telephone conversation whilst waiting for Bev outside the supermarket and it went like this. A lady was being asked to a BBQ and when she was asked she replied, ‘Thanks be to Jesus you have asked me’. When she was told that turtle would be on the menu she replied, ‘Praise be to Jesus for such good food’ and when asked if she would be coming she replied in the affirmative, ‘providing Jesus is willing, God bless our saviour’. Once the warriors were tamed by the missionaries anthropologists began visiting the area. 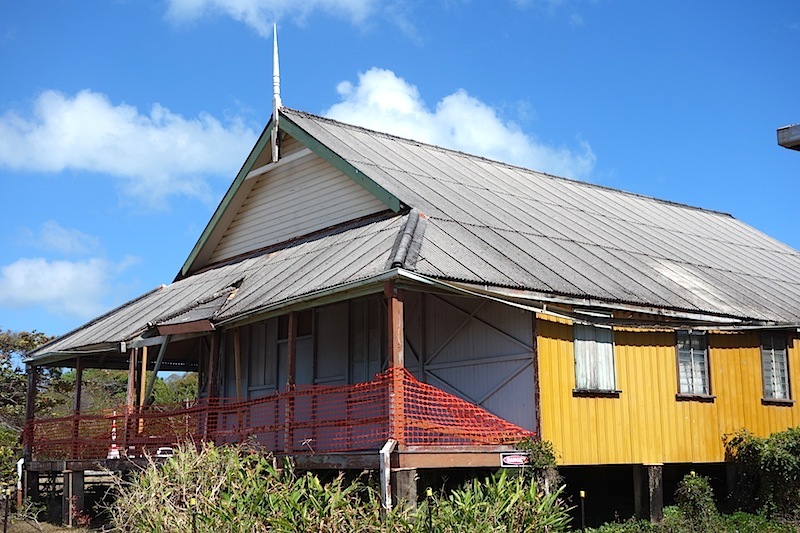 In 1898 an anthropological expedition from Cambridge England visited Torres Strait and their investigations suggested that prior to the Coming of the Light, islanders were distinctly religious following the beliefs of Zogoism. Followers of Zogo believe objects and places to be sacred. 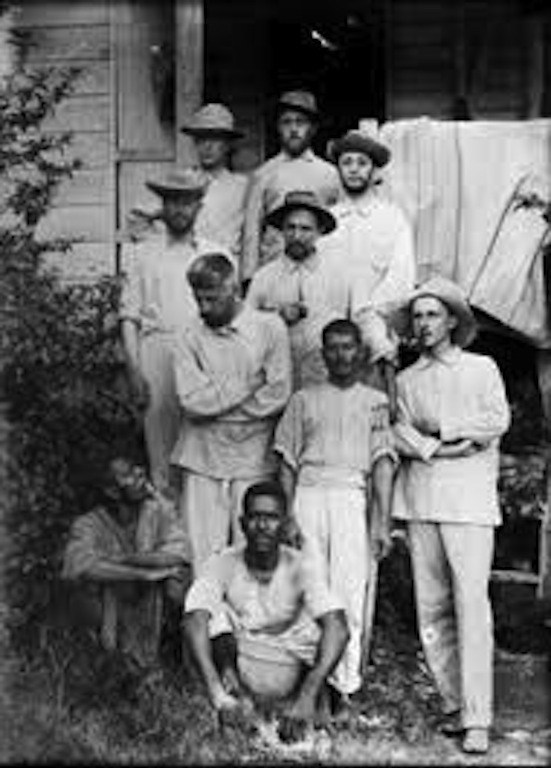 Cambridge Anthropological expedition members in 1898. When I look into the faces of people depicted in old photographs I see people I know and sometimes I even see myself (makes one wonder if there are moulds from which humans are created or maybe there is reincarnation). I wonder what the two gentlemen ignoring the camera are talking about? Also of note is the loose baggy clothing, obviously the fashion in hot humid climes of the time. 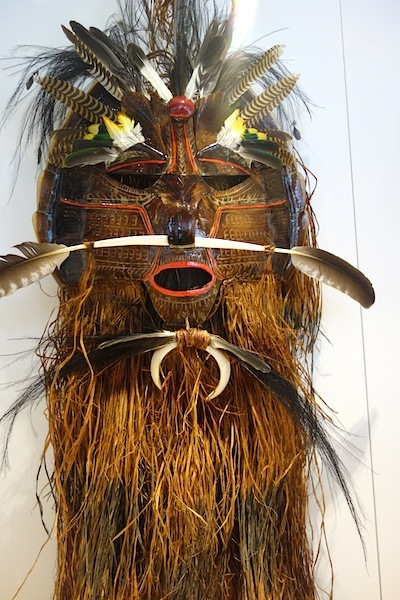 In days of Zogoism a mask like this would have been considered sacred, I think. 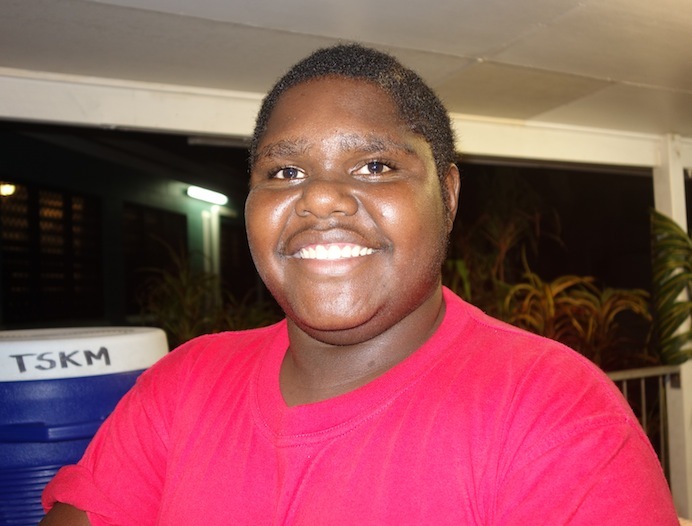 SOME MODERN FACES OF TORRES STRAIT. 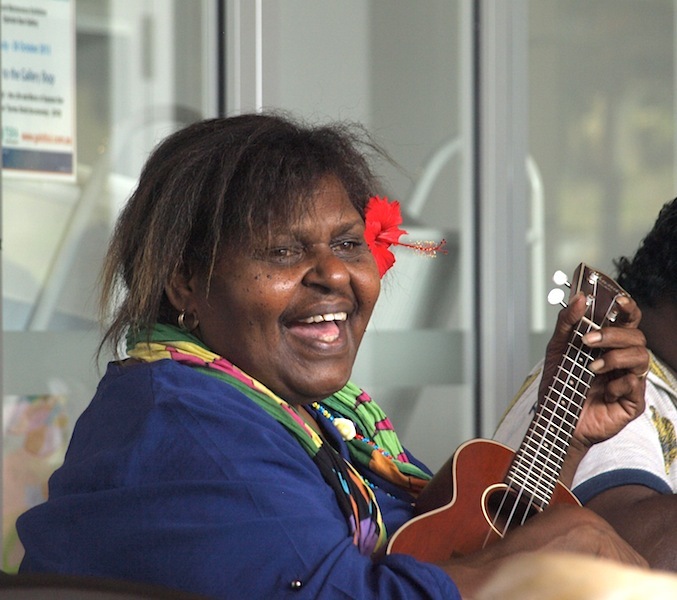 Torres Strait people have lovely smiles. 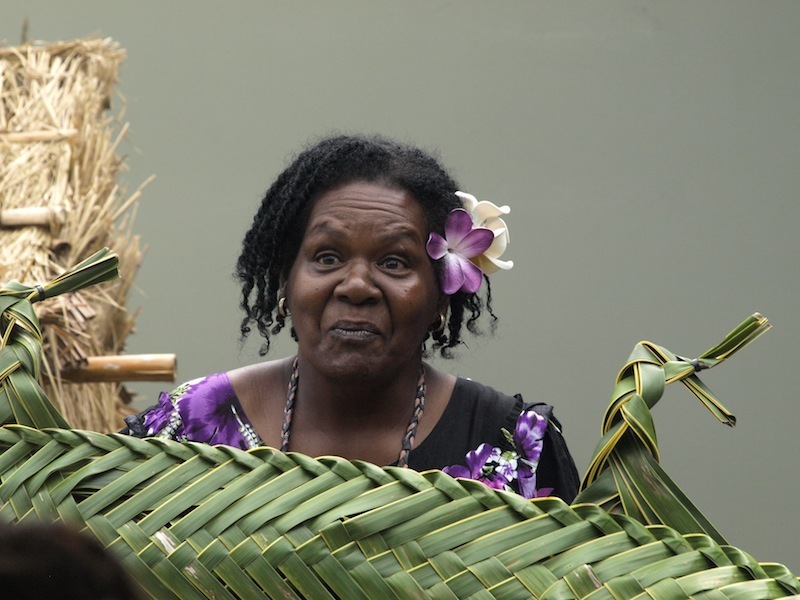 Storyteller Betty at the re-opening of the Gab Tatui Cultural Centre Thursday Island. 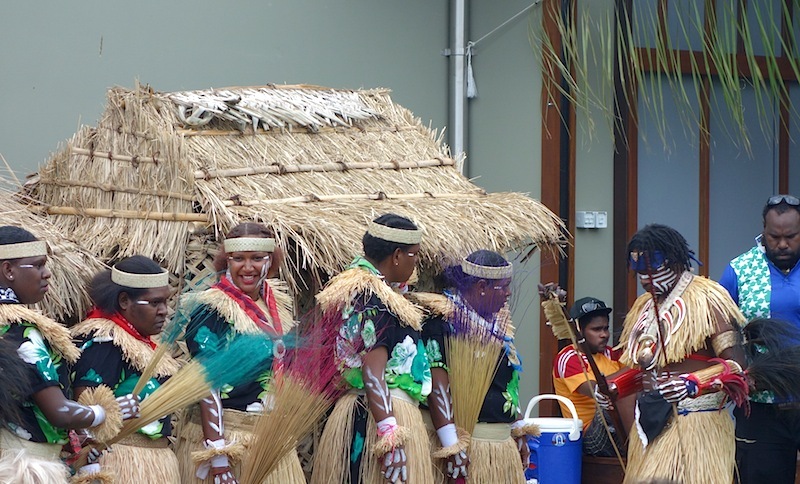 Dancers from Sabai Island getting ready to do what appeared to be the sweeping the floor dance! 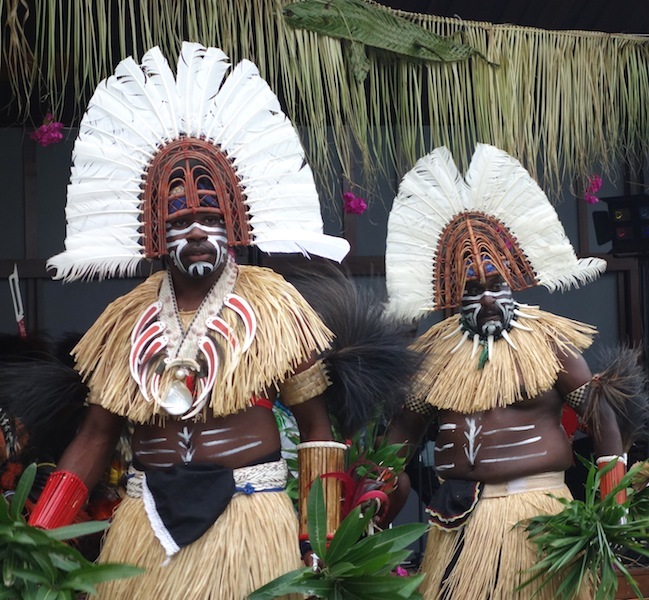 Sabai Island warriors in dancing garb at the cultural centre. Live entertainment at Gab Tatui. The next posting, Part 3, of our Torres Strait Encounter relates to early explorers and the discovery of Torres Strait. Don’t forget to leave a comment in the comment box. Bev and I are thinking about Torres Strait a lot. We may be heading back at the end of this odyssey (around October). I know it will be hot but it is the only time we can fit it in. On the Island of Kythera at the moment, highly recommended destination if and when you have the time. We will post stories about Kythera soon. I would like to gather all our friends together and take them to our favourite places. Fred and Bev X and this would be one of them. Again thanks for the encouragement. I’m hoping one day some one in publishing will come across the blog and want to do something with it. I reckon it would make a great talking book.